Matt Biolos threw a party for all the groms competing in the Surfing America USA Championships. The likes of Taylor Clark, Griffin and Crosby Colapinto, Noah and Koda Beschen, and Colt Ward amongst many other hungry and frothing groms showed up to eat some crepes, play foosball, and compete for Matt’s money. 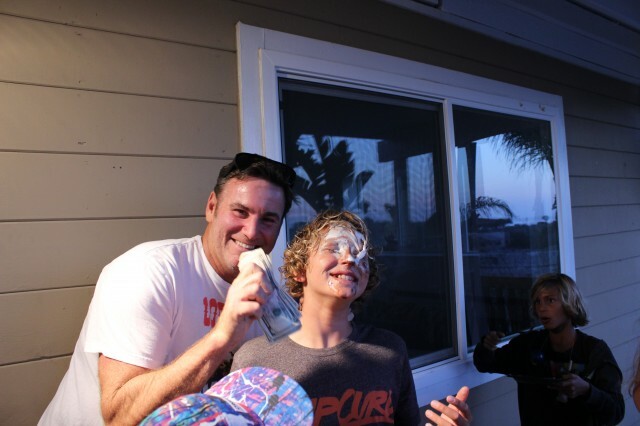 Matt threw money at the groms for doing ‘grom tricks’, which translates into whatever made him happy at the time. Taylor, Griffin, Colt, Crosby, and Taj playing this new game. We call it ball on a stick. Mayhem and his minions and his wad of cash. Taj Linbad getting rewarded for replicating Kei’s ball tricks. The boys counting their winnings. One dollar for each foosball goal. Noah showing off his Hawaiian tricks. And Palm tree climbing skills. A grom with dollar bills is a happy grom. This grom is about to catch Thunder. A captivated Thunder watched the palm tree climbing. The older guys had some knowledge of how to prepare a can for shotgunning. The grom on the right did not quite get it. The shotgun contest quickly led into a burping contest. Little Noah has an insane belch. Jake and Glen Davis getting a kick out of Noah’s burp in slow-motion. Fall over and try to not hit your face on the ground game. Crepe face stuffing by Grifindor. Matt and Crosby stoked on the night of fun.